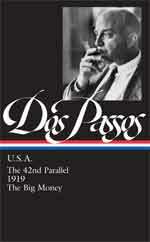 From John Dos Passos: U.S.A. There is little doubt, from later testimony, most notably that of Dr. Frank Bickford who admitted leading the raid, that the Legionnaires initiated the conflict. It is less clear who fired first, but it seems likely that the Wobblies fired first. In any event, shots soon came from all vantage points. The details of this incident, with its shockingly grisly conclusion, form the basis of “Paul Bunyan,” one of the biographical vignettes in John Dos Passos’s 1919 (the second book in his U.S.A. trilogy). Notes: A century ago, many laborers were paid in scrip (p. 747), a currency that could often be redeemed only in stores owned or managed by the employer. The Big Four (p. 747) refers to the leaders of the United State, Britain, Italy, and France, who met at the 1919 Paris Peace Conference. O.D. (p. 748) was a common abbreviation for olive drab. When Wesley Everest came home from overseas and got his discharge from the army he went back to his old job of logging. . . . If you don't see the full story below, click here (PDF) or click here (Google Docs) to read it—free!